Home » Tertiary Minerals (TYM) » Fluorspar future: strong outlook for steel, aluminium, and fluoropolymers – Tertiary Minerals (TYM). 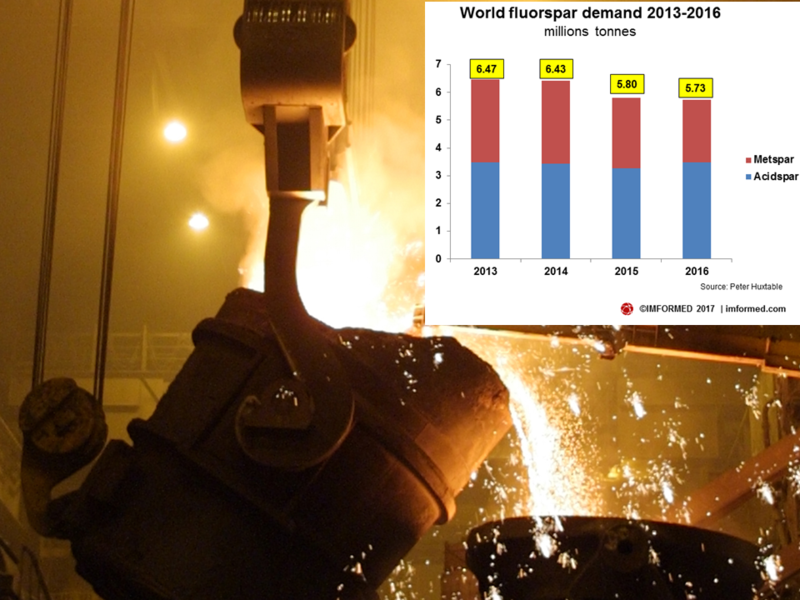 Fluorspar future: strong outlook for steel, aluminium, and fluoropolymers – Tertiary Minerals (TYM). By Alan Green in Tertiary Minerals (TYM) on 17th July 2017 . Despite a decline in world fluorspar demand in 2016 owing to weak demand particularly for metallurgical-grade material, the outlook remains strong for fluorine in the steel, aluminium, and fluoropolymer markets as prices firm during 2017. This was the essence of a review of the fluorspar market by Peter Huxtable, Huxtable Associates, UK published in Mining Engineering, July 2017. “Despite the continued sluggish world growth, demand and acidspar prices are expected to increase in 2017 due to lower overhanging stocks and production and supply in better balance.” said Huxtable. However, there remain some environmental concerns for fluorine products in the chemical sector, through the restricted use of certain fluorine compounds owing to their global warming potential. There is some threat of the use of non-fluorine containing compounds, for example in certain automobile air conditioning units, although the agreed acceptance of an alternative fluorine compound will maintain demand to some extent in other applications. Huxtable is co-authoring a paper “Fluorspar supply to 2018 and beyond” at Fluorine Forum 2017, San Luis Potosi, Mexico 30 October-2 November 2017, where all the key issues influencing the fluorine market will be discussed along with a visit to the world’s largest fluorspar producer Mexichem. “World fluorspar markets have been on a roller coaster in recent years — strong demand and high prices leading up to the 2008-2009 recession, a major slump during the recession, a strong rebound in 2011- 2012, but then a steady fall-back since.” said Huxtable. With prices recovering in 2017 and a healthy outlook in certain sectors, the industry could be ripe for another rebound. 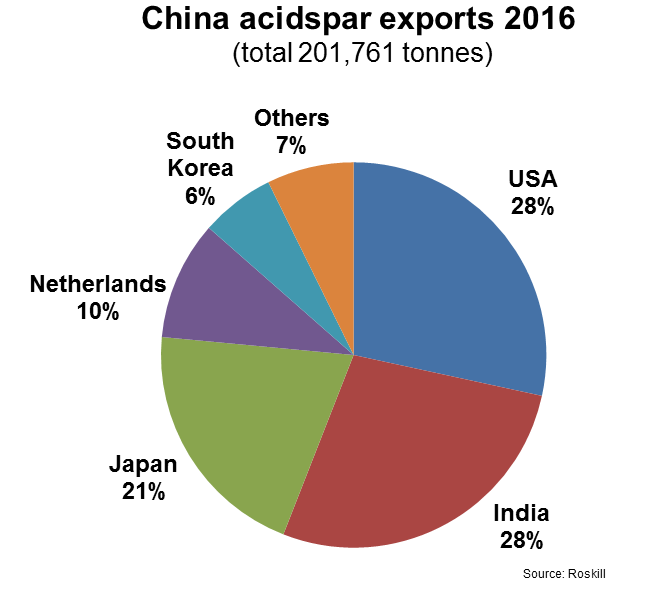 Prices fell in 2016 owing to overcapacity exacerbated by the new acidspar output since late 2014 from Vietnam (2016 year-end Chinese fluorspar was at US$260-270/tonne, which has since risen sharply, and according to some reports by 30-40%). Elsewhere, last year saw mine closures in Bulgaria and Kenya, while others reduced output, notably Mexico and Mongolia down to around 50% of more recent output rates this year. 2016 saw world production output drop to 5.68m tonnes in total. The new by-product output from the Masan Nui Phao tungsten operation in Vietnam remained close to the design output of 200,000 tpa. Reduced output from Mexico and Mongolia amounted to more than 500,000 tonnes, and from China around 300,000 tonnes. There were some increases from South Africa, and also some smaller output from new producers in Germany and Spain. Mongolia’s output remained low at 300,000 tonnes much of which was exported to Russia where UC Rusal’s 120,000 tpa Yaroslavsk operation remained closed. Canada Fluorspar Inc. received government approval mid-2016 and continued to develop its new processing plant and surface and underground ore supply. Commissioning is expected in the second half 2017 for the 200,000 tpa acidspar project in Newfoundland. Fluorsid Spa, Italy, purchased Boliden’s 40,000 tpa Noralf AlF3 plant in Odda, Norway in December 2016. This adds to the company’s portfolio of 60,000 tpa AlF3 and 10,000 tpa HF plants in Italy, and the 60,000 tpa British Fluorspar mine in the UK. 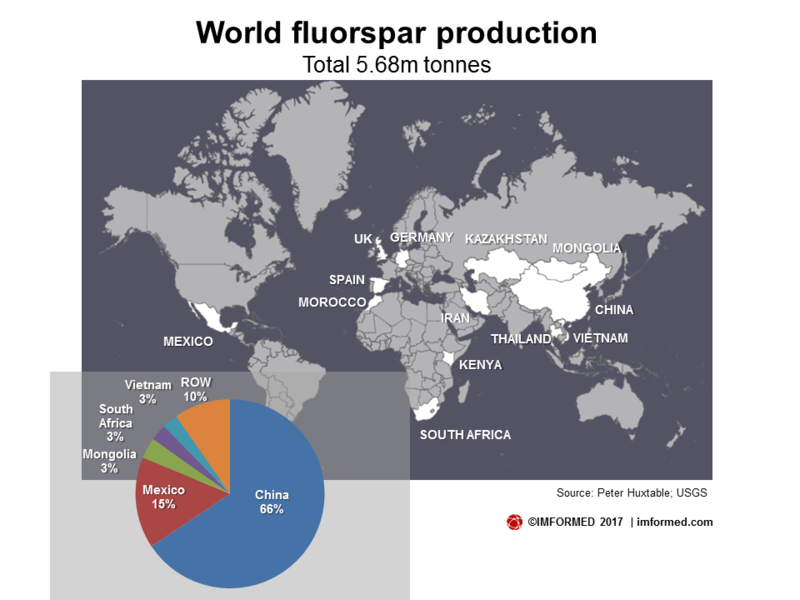 The USA remained reliant on fluorspar imports mainly from Mexico and China, as Hastie Mining and Trucking Co. continued limited fluorspar production from its mine in Kentucky, although intends to eventually produce both acidspar and metspar grades. The primary markets for fluorspar are for the production of hydrofluoric acid (HF; 40%), aluminium fluoride (AlF3) and synthetic cryolite, both used as a flux in aluminium smelting (20%); and in steelmaking (35%). The major end use for HF is in the manufacture of fluorocarbons used predominantly as refrigerants and as foam-blowing agents, in the production of fluoropolymers and fluoroelastomers, chemical derivatives, stainless steel pickling, and in other diverse uses. HF overall demand remained relatively flat in 2016 despite increased higher consumption by Japan since 2014. Production continued to increase as a result of the new Gulf Fluor facility in the UAE. 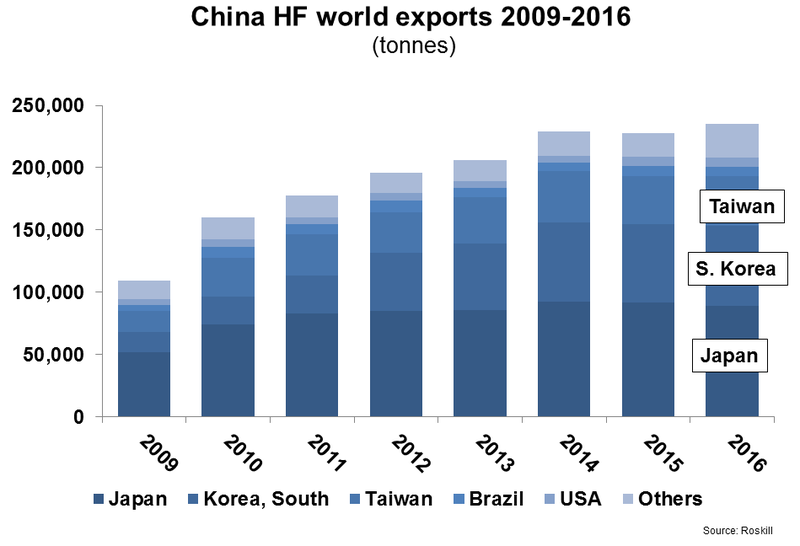 China accounted for some 40% of world HF output, with an increasing domestic market and important export trade. Worldwide demand for AlF3 was unchanged in 2016 at 1.2m tonnes. AlF3 consumption increased again in China, and also in India, Europe and Malaysia but reduced in the USA. Further restrictions on the use of HFCs were agreed by nearly 200 countries at the Montreal Protocol meeting in Kigali, Rwanda in October 2016. The US and EU will gradually reduce emissions by 10% of 2011- 2013 levels by 2019 and 85% by 2036. The acceptance by the EU, the USA and by the International Panel on Climate Change (IPPC) of refrigerant gas HFO- 1234yf with a global warming potential lower than CO2 as the preferred car air-conditioning replacement for HFC-134a (banned on new vehicles from January 2017) has sparked a raft of plant expansions by Honeywell, Arkema, and Chemours.